Dr. Edwin Jenner opens the metal blast doors to allow our brave Group entrance into the CDC. They must submit to blood tests as the price of admission. Once inside the underground facility, they think their problems are solved. However, they soon learn that Dr. Jenner is the lone survivor and that after the military cordon was overrun, all of the other scientists either fled or "opted out." They are understandably crushed by this revelation. But for the moment, safety, hot water, food (and wine) are a welcome distraction. 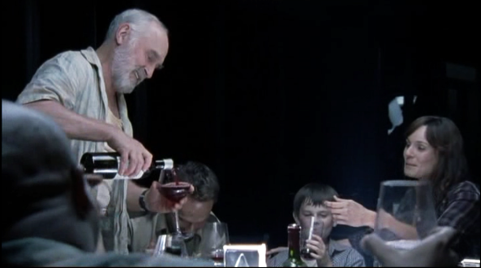 Dinner gets raucous very quickly with the addition of free-flowing red wine. Jenner would have generously opened up the larders of the CDC for his unexpected guests. After the lengthy trip, a carbohydrate-rich meal would have been ideal. 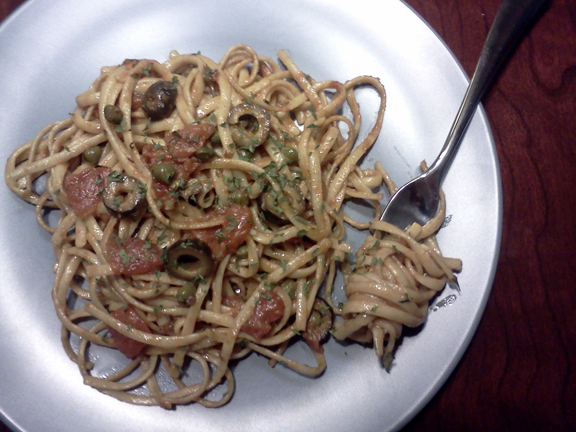 Pasta Puttanesca fits the bill. 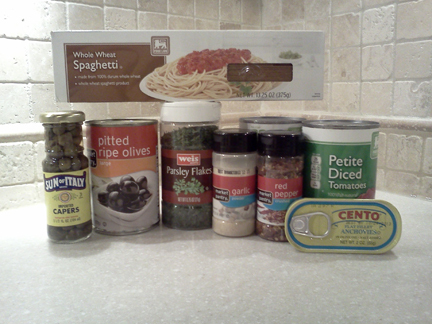 It contains only pantry ingredients but is packed with flavor, thanks to the addition of anchovies and olives. Break out any bottles of red wine your Group has managed to scavenge. And be sure to serve it all on authentic CDC kitchenware and glassware, purchased straight from the Atlanta IKEA. 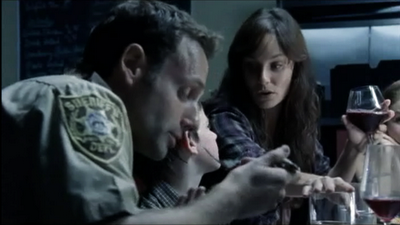 And when the dead rise; don't get stuck in the library with Shane. Bring a large pot of water to boil; add the pasta and cook according to the package directions for al dente preparation. Heat the oil in a large Dutch oven over medium heat. Add anchovies (undrained) and cook until they begin to melt. Add the parsley, olives, capers, garlic and crushed red pepper to the skillet. and saute for 2 more minutes. Add the tomatoes (do not drain) and simmer for 10-15 more minutes. When the pasta is al dente, drain and add to Dutch oven, tossing well with sauce. Top with cheese and serve. 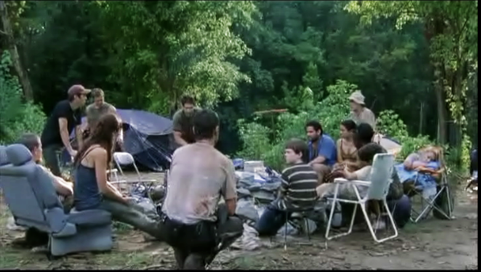 After the catastrophic Walker attack on the camp, the Group must dispose of the bodies; both human and Walker. In the hot Georgia sun, the work is exhausting. And particularly icky....each corpse must receive a massive head wound or they will reanimate. 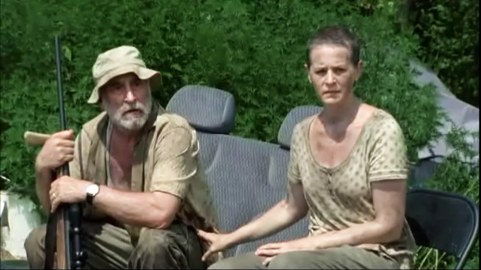 Glenn's insistence on burying (not burning) their lost human friends, including Amy, only creates more work. Upon learning that Jim was bitten, the Group has no choice but to head to the Centers for Disease Control in hopes of finding treatment. The Morales family decides to break from the Group and make a go of it alone. 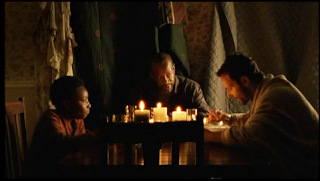 RIck leaves instructions in hopes that Morgan and Duane will join them at the CDC. 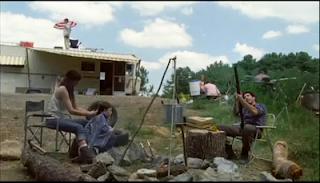 Along the way, Jim's health deteriorates further and the Group is forced to call a halt. After hallucinations and lots of gagging...Jim asks to be left behind to face his fate alone. They make their way to the CDC and have a Close-Encounters-like experience and walk into a white light. 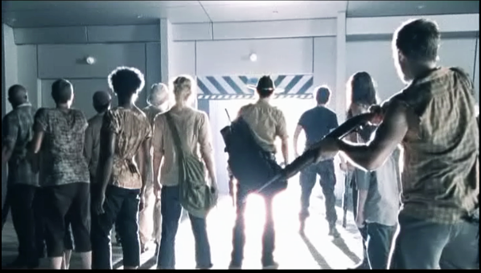 Is this the end of our brave survivors? Will they live to see another day or will they end up Walker-Meat? Regardless of the outcome, at least they have a full stomach. 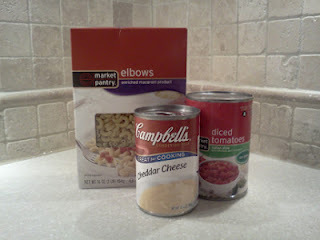 In the rush, they'd have to prepare a quick meal using RV canned pantry staples. 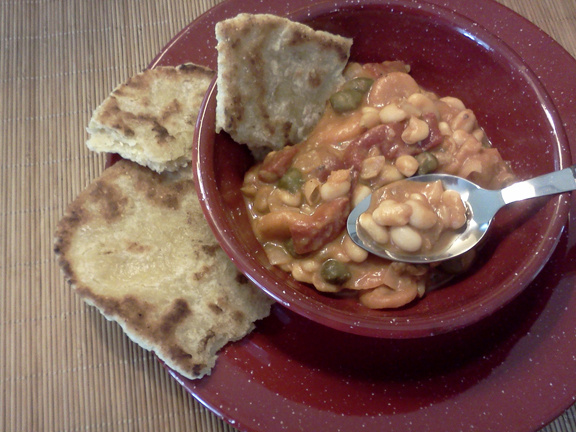 This recipe was adapted from a Boy Scout recipe called "Cowboy Stew." We think it can appropriately renamed "Survivor Stew." Feel free to substitute whatever canned vegetables and seasonings your Group has been able to scavenge. 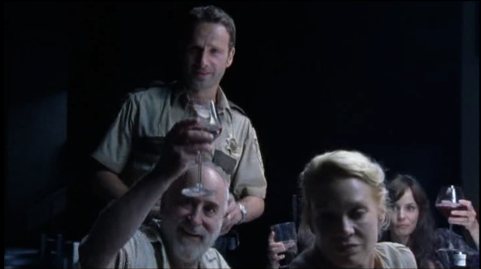 And when the dead rise; don't let blonde girls hamstring you. "We don't burn them! We bury them...understand?" 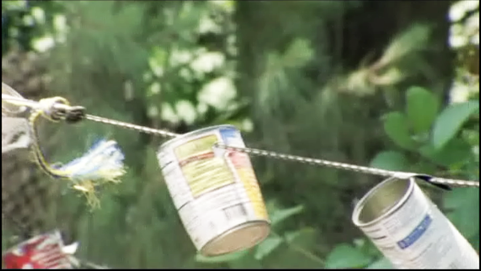 Open all cans. 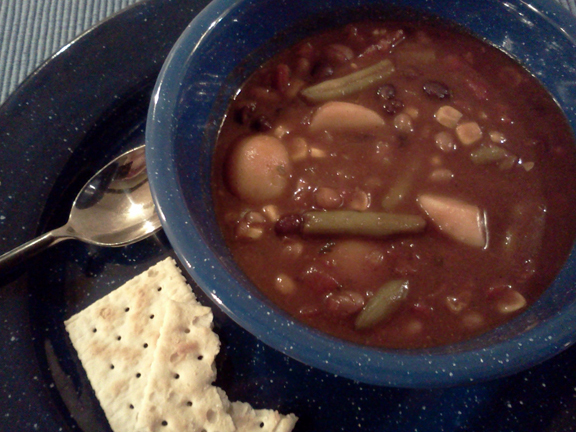 In a Dutch oven, over hot coals, combine Grillin' Beans, black beans, tomato soup, sweet corn and diced tomatoes. Drain liquid from the green beans and potatoes and add to the stew. Stir well. Add seasonings and allow to simmer gently for 20 minutes (or less if your Group is in a real hurry) until flavors are combined. Taste and season with garlic powder, salt and pepper if desired. Serve with crackers and then get out of town! Using Dale Horvath's canoe and gear, Amy and her sister Andrea catch enough fish to feed the entire group. 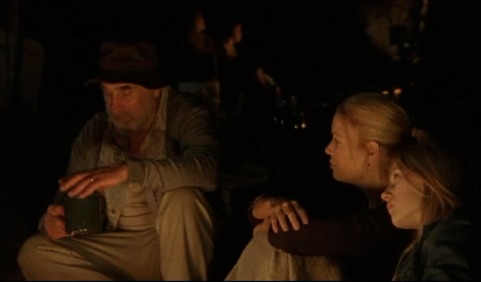 While on the lake, they talk about fishing with their father as chidren; and how he raised each of them differently. And in his own way, he respected what made each of them unique. That night, around the fire, everyone (except Ed Peletier, who was being punished for not playing nice) enjoys the catch....fried crispy and made better with cold beer. Hopefully at your survivor camp, there is a safe body of water and enough non-rusty fishing gear to provide for the entire Group. Feel free to add whatever seasonings your Group was able to scavenge in your area. Maryland Zombie Apocalypse Survivors will no doubt favor Old Bay® Seafood Seasoning. Paul Prudhomme's Seafood Magic will work also. 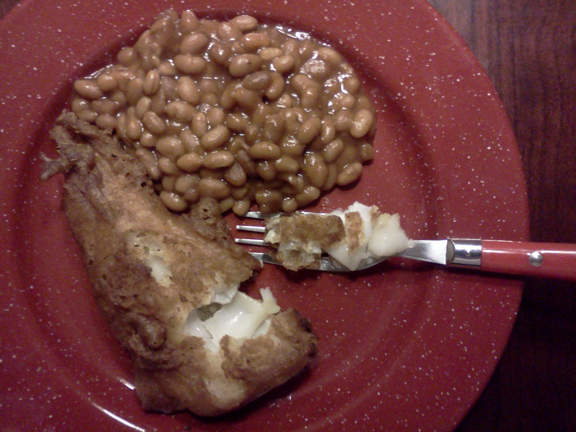 Of course, no fish fry would be complete without a Walker attack at the end of it. And as the episode closes, our brave Group of survivors have been whittled down yet again. The WDSCB is certain that your Group will be more cautious and post a look-out during your own fish-fry. And when the dead rise; no crying in the boat! Pour oil into cast iron skillet or Dutch oven and heat on stove or coals to about 425°. Drop fish fillets into flour and shake off excess. Place fish pieces on towel and dry for a few minutes. 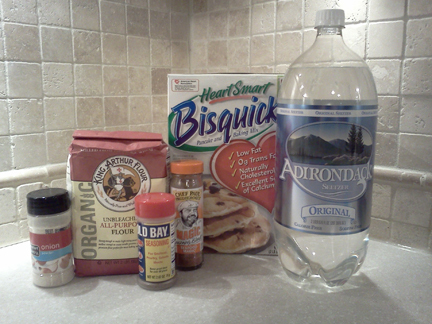 In a shallow dish, mix pancake mix, club soda and seasonings until a thin batter forms. Dip floured fish fillets into batter and carefully place into the hot oil. Fry each piece for 3-4 minutes per side. 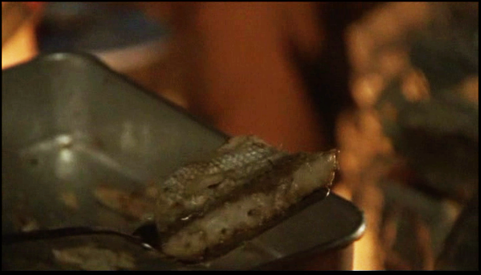 Fish should be golden brown and puffy on all sides. Cool slightly and drain on a rack and serve with baked beans. At the quarry survivor camp, Deputy Shane Walsh explains to Carl Grimes how they will catch frogs to prepare Cajun style frogs' legs for the group. 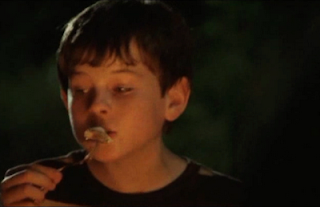 He claimed that after the survivors tire of eating canned beans they'd be loving frogs' legs. 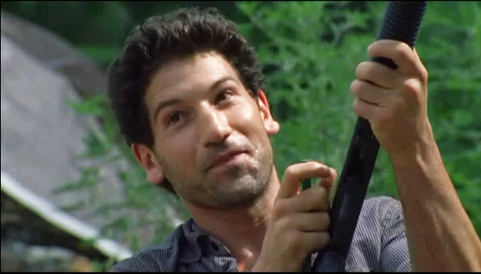 The WDSCB believes that in addition to his extremely unfortunate hairdo choice in Season 2, Shane is mistaken here also. 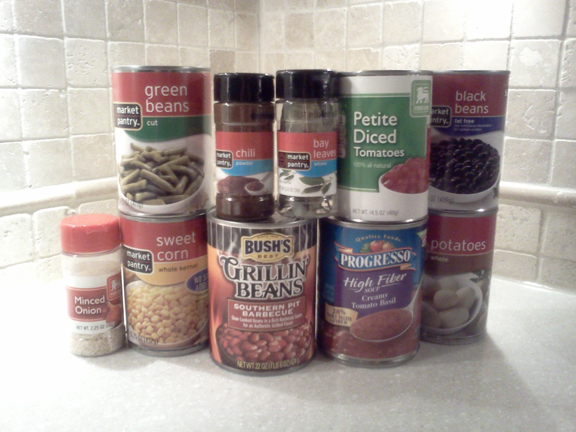 The possibilities of canned beans are endless. Trust us, your Group will never get sick of beans. When the dead rise; beans will save the world. In a large Dutch oven, heat oil over medium heat. Add onions and warm for 2 minutes. 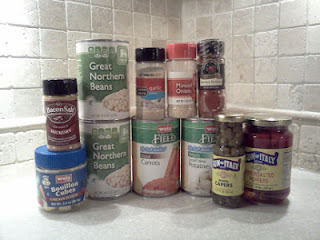 Add garlic, beans, smoked paprika, Bacon Salt, and stock. Bring to a boil and cook for 15 minutes. Add carrots, potatoes, peppers, capers and heat gently for 5 more minutes. Stir together flour, cornmeal, baking powder and salt. With a fork or pastry blender, cut in shortening until crumbly. Stir in water and mix until dough forms into a sticky ball. On a floured flat surface, pat out into a ball. Divide dough into six portions and pat each portion into a six-inch oval. In a large Dutch oven or cast iron skillet, heat 2 Tbsp. shortening over medium heat. Fry dough ovals one at a time for 2 to 3 minutes per side or until golden and bubbling. Amy emerges from the woods at the quarry survivor camp with a tiny stash of mushrooms. 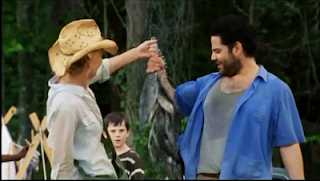 When she is unsure how to determine whether or not they are poisonous, Lori (The Terrible) Grimes explains that there is only one sure way to tell. The audience is never shown how to make this determination. At your survivor campsite, you may be fortunate enough to find wild mushrooms. And to have a co-survivor who knows how to gather them safely. If not, dried or canned mushrooms will work fine for this recipe. 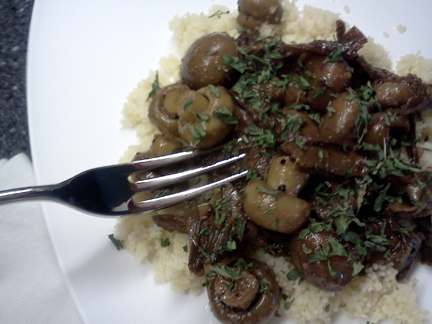 You may serve campfire sautéed mushrooms over cooked rice, orzo or couscous. A little Parmesan cheese and some dried parsley will finish it perfectly. Is dried parsley really necessary you ask?.......Yes, we say! Because when the dead rise; presentation still counts. In a cast iron skillet over the low embers of your campfire, combine oil, minced onion, and honey. Cook and stir for 30 seconds. 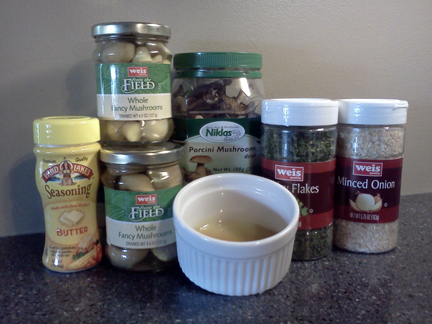 Add fresh mushrooms (or jar/dried mushroom combination). Cook for 7-9 minutes (fresh), or 4-6 minutes (jar/dried). This will depend on the heat of your Group's campfire. Season to taste with sea salt and pepper. Before serving, stir in butter sprinkles, parsley and parmesan cheese to taste. You may serve it over hot rice, orzo or couscous. He staggers out of the abandoned hospital he finds himself in. 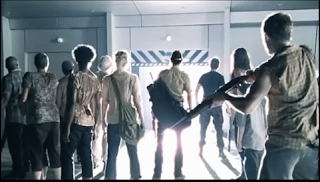 Disoriented, Rick is shocked by the sight of hundreds of decaying corpses littering the hospital halls and loading dock. He is quickly rescued by Morgan Jones and his son Duane. 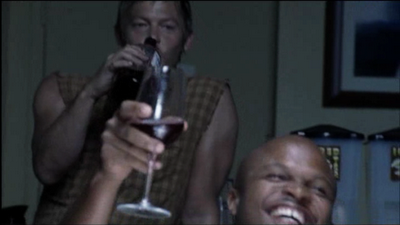 The three hide out in the vacant home of Fred and Cindy Drake, Rick’s former neighbors. 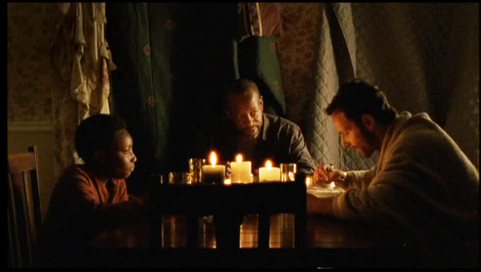 With no electricity, Morgan prepares their evening meal by candlelight using cans of Sterno®. We can imagine he used staple items from the Drake’s pantry. Morgan went to great lengths to make life seem normal for his son. 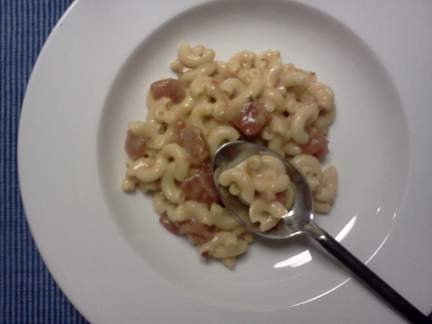 Kids love macaroni and cheese so Morgan likely kept the menu simple with this favorite. This very simple recipe can be made with only three ingredients and water. 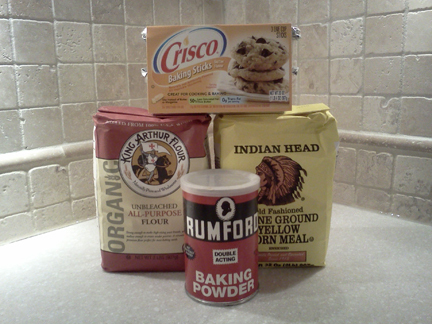 You can easily keep the ingredients on hand for any emergency. Including a Zombie Apocalypse. And when the dead rise; don’t forget the Sterno®. Optional seasonings: Crushed red pepper, garlic powder, ground mustard. until combined and smooth. If necessary, add the other 1/2 cup of reserved water a few tablespoons at a time. Stir in herbs if you have them and serve. *In case you were wondering...Rick's last meal before being shot was a burger and fries. 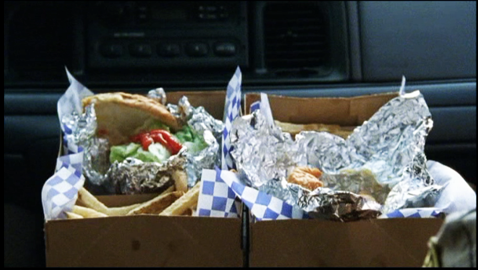 After the Zombie Apocalypse, there will be no more McLunches. So we all need to learn how to cook together!